This was an engaging short tale. The old rich language and sentences helped create an atmosphere of gothic horror. I have to say – comparing the novel to Gautier’s Clarimonde, it is nowhere near as dark or as decadent. It was a good start for the genre though, with the additional elements of poetry and travel. 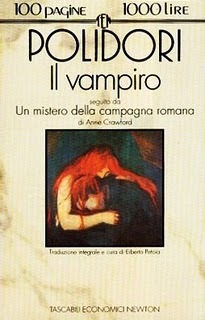 This was apparently the first vampire tale to be published in English (1819) and at the outset it was thought to be written by Byron – not Polidori. Polidori had been Byron’s physician on some European travels. The reason I read this novella was a footnote in Lemontov’s ‘A Hero of Our Time’ which referenced Polidori’s story. I then searched in the Kindle store and there it was for free download, so I started reading immediately. Sometimes technology can be a great thing. Definitely worth reading. This was a good novel. At times it seemed a little over-the-top with some of the emotive language but this could have been the old translation. The book was written a hundred years ago too, for a political purpose, so we can give it some leeway. A good story. As mentioned in the previous post Gorky has very strong female characters, which if you compare to the writers of his time is unique. I can’t imagine Conrad, despite his genius, having a character like ‘the mother’ – Vlasova. What is really interesting is the subtle movement (Gorky controls this very well) from an oppressed peasant, easily controlled, to a woman full of life and purpose. She always had those qualities, but the very narrow hand-to-mouth way she had been living kept her downtrodden and without hope. I’m glad I read this, but I have to admit I like Gorky’s autobiographies more. Probably because there is more breadth. Mother, like the characters in the novel has political purpose. While this is understandable, it is maybe not as engaging to the modern reader. In context, we can see how this would have been an important novel for the working people in Russia at the turn of last century. The novel understood and highlighted their problems. Maybe it isn’t as sublime as Zola’s Germinal but Mother was a more direct call to action for the oppressed. The first volume of Gorky’s autobiography, My Childhood, was so good I decided to read the second installment ‘In the World’. 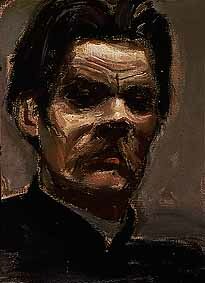 If anything, ‘In the World’ deepened my appreciation of Gorky. He is brutally honest throughout and nothing is left out because it is too harsh or distasteful. The man must have had real strength of character to deal with such hardship and come out with a positive world view. A large part of the reason for that must be his grandmother who was a formative influence on him. In the Gorky books I have read there are always strong female characters and ‘In the World’ is no exception. This quote from the book seems to explain what he was trying to do. I am a lover of humanity and I have no desire to make any one miserable, but one must not be sentimental, nor hide the grim truth with the motley words of beautiful lies. Let us face life as it is! All that is good and human in our hearts and brains needs renewing. There are problems with the the translation – it is very much of its time – 1917. The translation of ‘My Childhood’ was better. Still, it didn’t get in the way too much as Gorky kept me interested. The final volume, ‘My Universities’, doesn’t seem to be in the public domain but I will keep my eyes open for a modern translation to finish the autobiography on a good, well-translated note. The refrain that sounds through ‘In the World’ is one of education and that books can be a path to a better life. In Gorky’s case this was true and this sentiment is also seen in the novel ‘Mother’ that I am currently reading. If you have never read Gorky before and want to try reading something brutally honest and quite different, as an antidote to the spin of our consumer culture, then start with ‘My Childhood’ and carry on through the three books. Soundtrack: Tom Petty and the Heartbreakers – Southern Accents. A very interesting book that sheds light on our current economic woes. I had no idea that the investment banks worked the way they do, and that they are basically casinos creating a plethora of risk products to sell on to investors. Some of the products and risks associated are absolutely ridiculous – there is so much abstraction involved. The book does what it sets out to do in an intelligent, understandable and entertaining way. I had no problem with the content and it was easy to read. So, what were the underpinning causes of the 2008 (and continuing) recession? There were a few – lack of regulation, irresponsible attitudes to and understanding of risk, problematic mathematical formulas, Alan Greenspan and his cult of personality, the culture of owning your own home and its promotion by governments, and the culture of To Big To Fail in the financial sector where there was no cost to failure. I may have missed something out… Of course, the free-marketeers will say consumers taking on untenable levels of debt is a major cause. True, but it was more a symptom of some of the above primary causes. If people are encouraged by professionals and governments to get into debt then they will. Not every consumer has the benefit of a good education and can critically appraise their financial risk objectively. If the banks couldn’t assess their risk properly – how could consumers? So, much food for thought in this book. Part of the reason for the crisis was lack of understanding of what banks and their mathematicians were doing. This analysis demystifies their obscurantism, rituals and acronyms. Soundtrack: Bailterspace – Robot World.